.32 carats total weight of diamonds are set in these heart shaped 14K two-tone gold earrings. 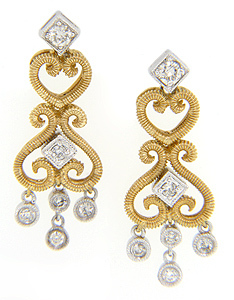 The earrings, set on posts, feature a curving, dangling design. The yellow gold heart patterns are contrasted by the diamonds set in white gold. The earrings measure 1” by 3/8”.